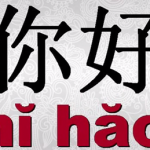 How Do You Say Hi or Hello in Mandarin Chinese? The first two things you need to know if you want to say Hi or Hello in Chinese. Watch the video for the best way of saying it correctly. In many languages, these two words are very important to start conversation with almost anybody. I believe that even if you do not know anything else to say, this will make the person to want to have some conversation with you. In Chinese language, like in my native language, there are two basic ways of saying this. The first one is formal and second one is informal. How do you say “Hello” in the formal Chinese setting? First know that this formal one is used when you do not know the person you are talking to and always use it if you are talking to obviously older person than you are. You can paste the words to Google Translate tool and listen the pronunciacion correctly and try to repeat after them. That is my free way of trying to mimic the tones in Mandarin. Of course if you have the Rocket Chinese program, you can record yourself speaking it and comparing the tones to a native speaker. How Do You Say Hi In Informal Chinese? So basically to say hello or hi in Mandarin language you are saying — “You Good”! Try to remember even the look of the characters. Because it is great to start also learning to read. What I do is that I go to Chinese websites and try to fing the characters I already know. I really do not leave the page unless I find them. That way I memorize them and I never forget them. Try it out, you will see that they will stick in your memory! So by now, you should know completely well how to say Hello or Hi in Mandarin Chinese. Now, try to practice it out loud, visualize it, make the opportunity to say it as often as you like to as many people as you like. If they will look at you strangely, just tell them that you are learning Chinese and that it means Hello… you never know. Maybe the next person you say it to will love it and start learning too! And here that person could become your language partner. Sometimes it is great to have someone to practice with right away. Basically the most common version of this expression is the one I have shared with you above. But you need to know that most Chinese people won’t actually use that expression amongst their friends and relatives. It sound a but awkward and not personal. But if you do not know the person personally (someone on the street, at local shops, hotels, restaurants etc…), its very useful. Also everytime I am out with my Chinese friends shopping, they use this phrase to get the attention from the shopping assistant or waiter… which should now be technically the samy expression that we say in English — “Excuse me”… (I need to ask you something). So native speakers are actually using a lot of other expressions that mean “hello in Mandarin”, but actually the word-by-word meaning is way different. 大家好！ (dàjiā hǎo)- Meaning Hello Everybody! This one is used when you are trying to greet group of people. 你们好！- This one is also used as you enter room or place with more people. 早上好！(zǎoshang hǎo) or simply 早！(zǎo) – means Good morning or just Morning… you can use this type of hello every morning when you see someone. As you can see, in Mandarin Chinese there are so many ways of expressing the meaning of “hello” — and it all depends on situations. So more and more you will start having conversations with native Chinese speakers, you will learn a new and sometimes intriquing ways of greeting them. Thank you for following my That’s Why I Love Chinese blog and I hope some of my tips will help you or motivate you to speak Mandarin faster. 再见！— Zàijiàn = Good bye! or See you!